and with this being the case our home is on the road. We continue to make our “home” as comfortable as possible. December 2015 we purchased our brand new MDC XT-12 caravan/hybrid camper! Thus far it has treated us well, we are always the talk of the campsite with people always wanting to take a peak inside the compact home on wheels. One of the fantastic things about being married to a boilermaker is the custom-made drawer system Shaun built for the back of our 4WD. The system is constructed out of aluminium sheet which was pressed and folded for extra strength while still remaining lightweight. The storage system consists of one large, utility drawer in the centre, two side storage compartments with hinged lids. The side storage compartments conceal the second battery, fuse block and house our spare parts and tools. These lower storage areas create a false floor on top of which a MSA Drop-Down Fridge Slide carries our 60L ARB fridge. We have a 70L Huntsman Water tank at the cabin end of the canopy which is gravity fed to a tap on the storage compartment. To polish off the cosmetic appearance of the system the aluminium sheet has been finished with marine carpet. We have added a custom 12 volt system which is run from the second battery in the canopy. This system runs internal and external lighting, an inverter, power sockets and USB charging sockets. All the 12 volt system runs through a power management monitor. 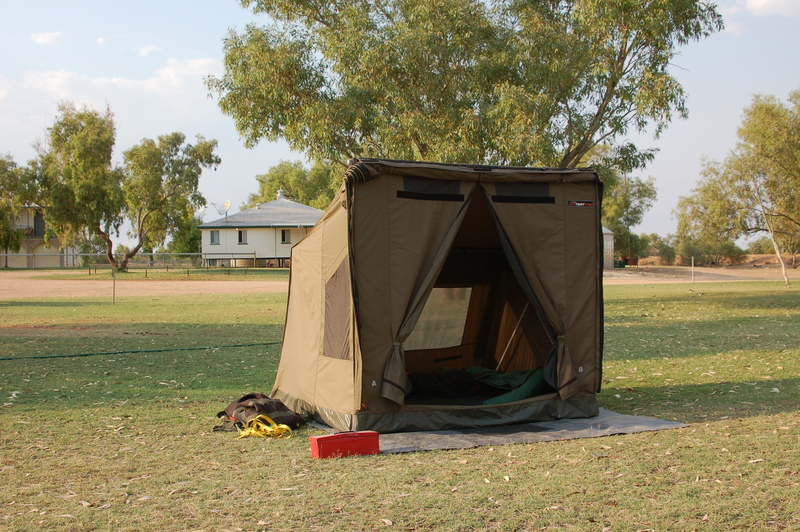 Even though we own an off-road caravan we still be carting our Oztent around the country. It is our simple answer to overnight, off the beaten track camping. It goes up in less than 30 seconds and fellow campers look on in awe. It’s sleek aluminium frame and rip-stop polycotton canvas makes for both easy set up and keeping you out of the elements. SOLD to wonderful new owners! Happy Travels! 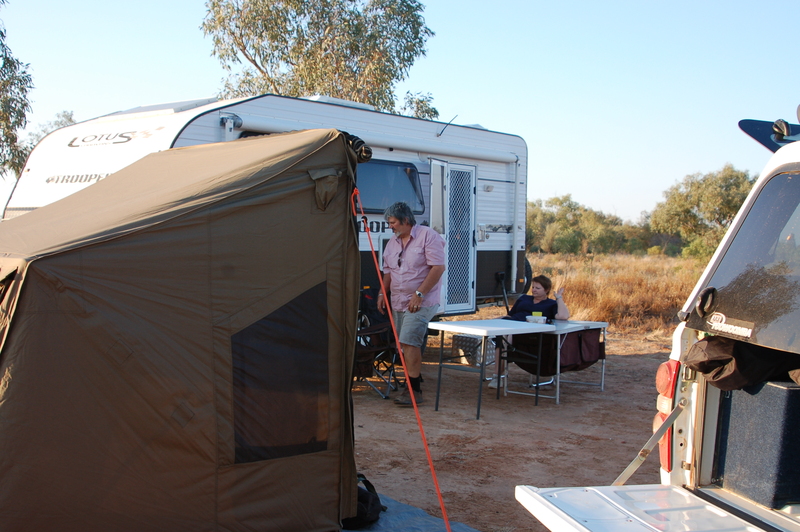 We previously travelled in a camper which we purchased at the 2012 Melbourne Camping Show in March. After much deliberation we finally decided on an MDC Off Road Camper manufactured in Brisbane, QLD. Our Camper is named Cooper after one of our favourite destination Cooper’s Creek. Did u take any photos of riders while down at finke? Any of 537 by any chance? Thanks for your comment Kim. We took quite a few photos around the start/finish line. Was it a bike or a buggy? I will have a look through and see if there are any there? Which position did it come? Thanks for reading! Nice setup guys. Looks like you are well prepared to travel. How do you find the MDC? The MDC is fantastic. We purchased before they became cool and it hasn’t let us down. It’s travelled around Australia with us. We have a Mazda BT 50 dual cab, which took over a year ago from our much-loved 1997 Prado, and we tow a Kimberley Kamper. Love it to bits! My parents have a Mazda BT 50 which tows a Lotus Trooper!! They LOVE it. I love our Colorado. It has done good by us thus far! Very cool. Wish I was back there. Unfortunately, got sucked into going bsck to jail – I mean (ahem) – work. Love Oz. I will continue to blog about my travels there on photoblogger99.com. Love your photos! Checked out google maps to locate Birdsville. My chance to visit Australia, lol. Have fun! Thank you Debi. Birdsville is really the final frontier. Outback Australia at its finest. Beautiful Pictures!! It’s been a long time since I visited Australia but this definitely makes me want to go back. You guys are so awesome! I aspire to do what you both are doing one day!! A big thank you. We are happy to inspire others to travel this wonderful country. Great photos. I can see that you both had an amazing time spending together with camping. How offroad capable is the MDC? Where would you not take it? Fantastic blog! I am thinking of buying a XT12. Any regrets or faults you have found so far? We are loving our XT12! We haven’t come across any faults as such. We had a few minor issues and they were rectified immediately. ie radio not working. If you are in QLD contact Heath at the Sunshine Coast store. We went to multiple stores and we found Heath to be the best! Hi guys, how are you finding storage on the XT12? Are you having to out big things like tables etc on the floor inside? Hi Mark, We are finding storage quite good. In fact we haven’t filled all the hidey holes as yet. We put our folding camp-tables in the canopy of our 4WD. At the moment we are trying to work out what to put where to create ease of access.